[NightHawkInLight] has been playing around with the diamagnetic properties of bismuth. Diamagnetic materials get a lot of attention due to their strange ability to produce the opposite of the magnetic field going through them. In simpler terms, metals like iron are attracted to magnets; metals like bismuth repel them. [NightHawkInLight] built his own interpretation of a common lab example used to demonstrate this remarkable property, a levitator. A levitator is made by sandwiching a magnet between two plates of diamagnetic material. One of the plates is given a magnetic field opposite of the magnet underneath it by a stronger magnet placed some distance away. When this is done, the magnet in between wants to repel away from the plate above, only to find that as it gets closer to the plate below it is equally repelled, creating a stable system. 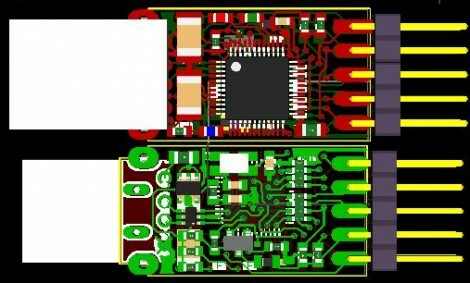 Versaloon is an open source, USB connected project, that centers around an STM32 processor and provides a standard JTAG pinout. Above you see the Nano version which has a 10-pin JTAG connector, but there is also a 20-pin option on the Handy model. Great, another JTAG programmer. Well this can do a bit more than that. With a bit of help from the software it has been turned into a programmer for ten different types of hardware. Obviously this should be able to program anything that works with the JTAG protocol, but the script adapts it to work as an In System (or In Circuit) Programmer too. So far the list of programming targets includes STM32, LPC1000, LPC900, STM8, AR8, MSP430, and a few others. We had some trouble finding an actual picture of this hardware. If you’ve got one, snap a picture and leave a link to it in the comments along with your thoughts on the device.